Surfa DAMP SHIELD is an elastomeric waterproof liquid coating specially formulated for all exterior masonary surfaces. Elastomeric properties in the product ensure crack bridging ability. Strong adhesion to masonary substrates. Easy to apply and simple re-coating. New masonary surfaces must be allowed to cure completely. Ensure that the surface is thoroughly cleaned and rendered free of dust, oil, grease, grime, loose particles, algae and fungus etc. Portions and hollow areas must be properly repaired. Apply a self priming coat of Surfa Damp Shield (diluted with water 31 ratio). Achieve a forced coverage of 25 sq ft/lit/coat. Allow to dry for 4-6 hours between coats. (diluted with water in 31 ratio). 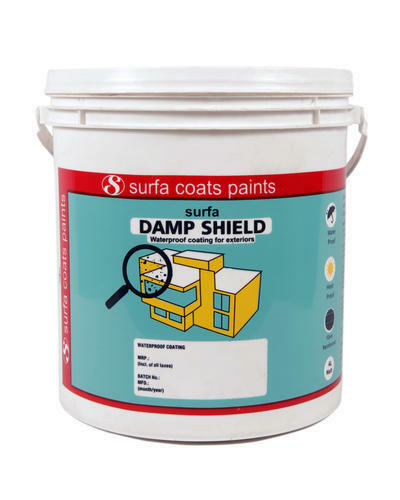 Apply 1 coat of Surfa Damp Shield without dilution at the rate of 30-35 sq ft/ltr consumption. Apply 2 coats of Surfex Rain Shield-Exterior Emulsion Paint of the desired shade. For best performance on terraces, ensure that the product is applied on the entire roof including parapet wall to form a continuous blanket. On horizontal surface - 10 sqft/ltr. On vertical walls - 20-25 sqft/ltr. A few decades ago in the year 1979, Surfa Coats a success story in the realm of colours was born. In its journey over the years, it took courage and commitment for Surfa Coats to stand firm and build the beautiful path as an eco-friendly paint company. This pioneering strength is seen each day, in each product of Surfa Coats. The unbeatable quality, the intricate depth and sophisticated flourish in each colour, has made it a much admired paint company. The modern and automated manufacturing units across 2 states of India, gives Surfa Coats a strong presence. Constant innovation, cutting-edge research and vibrant production practices ensures each Surfa Coats customer is truly benefitted and greatly satisfied with the Surfa Coats colour palette today. ISO certification, member of IGBC ( Indian Green Building Council ) and strong sales and dealer network makes Surfa Coats a winner for both today and the future. Go on and enjoy the Surfa Coats brilliance in your life today.